Forget about wearing your heart on your sleeve, wear it on your feet instead! 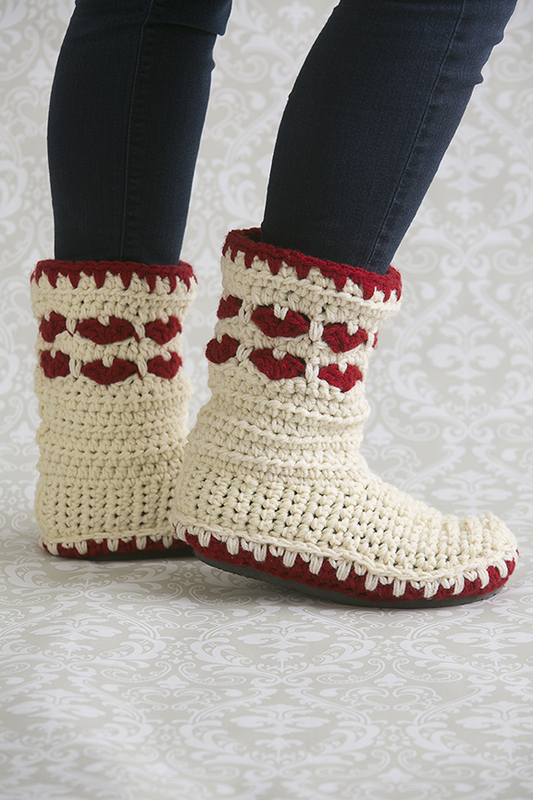 This Valentine’s Day, crochet your own cozy slippers to laze around the house in. Instructions are included to attach a rubber sole so your slippers have some extra stability. Spike sc: Work a sc into the 2nd row below hook. 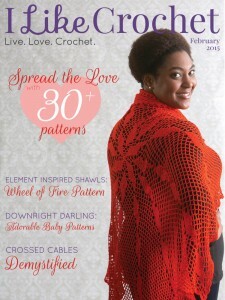 This pattern starts at the toe and works up. Hold 2 strands of yarn together as one, unless otherwise noted. Please choose from the size list below before starting directions. Choose your size and do the beginning row as listed for the size you choose, then continue with row 1. Sizes 5-6: Ch 2, place 10 sc in sec ch from hook. Sizes 7-8: Ch 2, place 12 sc in sec ch from hook. Sizes 9-10: Ch 2, place 14 sc in sec ch from hook. Starting row: Choose your starting row from above, then continue with row 1. Row 2: Sc in each st around, join, ch 1, turn. Repeat last row 15 times more. Fasten off. Turn piece inside out. Using yarn needle and 1 strand of yarn, close the seam along the heel. Alternatively you can sl st both sides together to close it), fasten off. Turn right side out. Attach yarn to back center heel with a sc, with right side facing, inserting hook from outside to inside, ch 1, sc in each st around the entire opening 32 sts, for a total of 32 sts, ch 2, turn. Row 1: Hdc in each st around. Repeat row 1 5 more times. 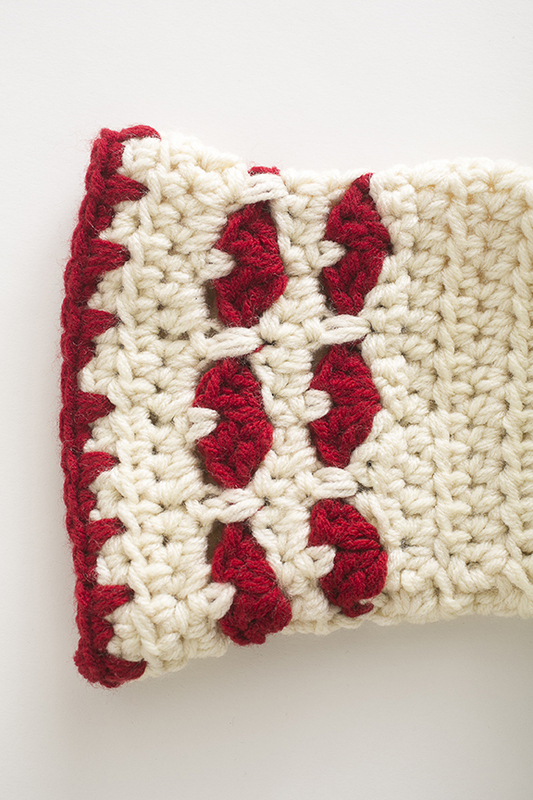 Attach red yarn in center back with a sc, ch 1, *sk 2, (2 dc, ch 1, 2 dc) in next st, sk 2, sl st in next st*. Repeat * to end of row, ending with a shell, sl st into beginning ch 1. Fasten off. Attach main color with a sc in the row below, in same st as ending sl st of previous row. Row 2: Ch 2, hdc around, join with a sl st in beg ch 2. Repeat last 3 rows once more. Do not fasten off. Repeat row 2, twice more. Fasten off. Attach red yarn. Keeping in pattern of the sc spike sts, do a sc spike row. Fasten off. Weave /tie all ends. Ch 1, work 54 (58, 62) sc around entire outer edge of sole, do not fasten off. Weave/tie ends. Repeat sc edging row 1 more time crocheting in back loops only, this row only. Repeat sc edging row 1 more time in both loops. Fasten off. Attach ivory yarn in center back heel with a sc, ch 1, *sc in next st, spike sc in next st* repeat * around to end of row, sl st into beginning ch 1. Fasten off. Weave/tie ends. Place boot inside the footbed. Pin in place to keep spacing correct. Using a yarn needle and one strand of yarn, start at the heel, stitch the footbed to the boot. Stay on the top row, and use a running stitch all the way around. Keep your stitches loose. Drawing them tight will make the boot look wrinkled. Tie off. If you are using flip flops, cut off the straps, and pull the little tabs out from the bottom and set aside. If you are using an eva foam mat or an anti-fatigue mat, put your boot on and trace around it on a piece of paper, then trace that onto the mat and cut out. Use sandpaper if you want a smoother edge. If you are using hot glue, your boot will be ready to wear in minutes. If you are using Contact Cement, you will need to use clamps to hold the sole in place and let dry for about an hour. A note about contact cement: Contact cement dries very quickly, so be sure to work quickly. Once it dries, it is almost impossible to pull apart. First, place your shoe onto the flip flop or cut sole. If it is bigger than your shoe, draw a line where the toe of the shoe ends, no more that ½ inch past the toe, then trim. This is important for a normal looking boot, and not have a long stretched out looking boot. Spread a layer of the cement all over your rubber sole, especially the edges, being careful not to drip over the edges. Press the boot/shoe onto your sole and line it up. You will see a “ridge” on the crocheted sole, where we stitched only in the back loop. Use this ledge as a guide on where to put the rubber sole. Put the ridge at the very edge of the rubber sole. Clamp the toe first, then the heel, then sides. Wait one hour for the glue to dry. Only glue around the edges of the sole, nowhere else. Lay the rubber sole or flip flop down on your work area, and place your boot/shoe on it. Trim if you need to, to no more that ½ inch past the toe of the boot. Starting at the heel, squeeze a line of glue on the bottom heel edge, right below the ridge. Place your rubber sole onto the glue. Hold for a minute to dry. Next, work around both sides. If you are using flip flops, trim the little tabs you took out of the bottom until they are almost flat. Then glue them back into the holes with just a little glue.